Explain what an immersion ultrasonic test is and why they are needed in NDT. Another way to couple the sound from transducer to a test object is coupling the sound with water. This can be done with squirters where the sound travels through a jet of water or by immersing the transducer and test object in a tank of water. Both techniques are called immersion testing. 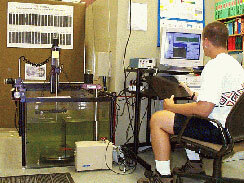 In immersion testing, the transducer is placed in the water, above the test object, and a beam of sound is projected. The graph of peaks using the immersion method is slightly different. Between the initial pulse and the back wall peaks there will be an additional peak caused by the sound wave going from the water to the test material. This additional peak is called the front wall peak. The ultrasonic tester can be adjusted to ignore the initial pulse peak, so the first peak it will show is the front wall peak. Some energy is lost when the waves hit the test material, so the front wall peak is slightly lower than the peak of the initial pulse. Ultrasonic testing is an NDT test technique that interrogates components and structures to detect internal and surface breaking defects, and measures wall thickness on hard (typically metallic or ceramic) components and structures. How does ultrasonic testing work? Ultrasonic operates on the principle of injecting a very short pulse of ultrasound (typically between 0.1 MHz and 100 Mhz) into a component or structure, and then receiving and analyzing any reflected sound pulses. Conventionally, an operator scans a transducer over the surface of the component in such a way that he inspects all the area that is required to be tested by means of a scanning motion. The inspection relies on the training and integrity of the operator to ensure that he has inspected all that is necessary. Sound pulses reflected from features within the component or structure are conventionally displayed on a screen. The operator also has to interpret these signals and report if the component or structure is defective or acceptable according to the test specification that he is given. Typical detection limits for fine grained steel structures or components (hand scanning) are single millimeter sized defects. Smaller defects can be detected by immersion testing and a programmed scan pattern with higher frequency ultrasound (slower testing). Detection limits are in the order of 0.1 to 0.2 mm, although smaller defects (typically 0.04mm diameter) can be detected under laboratory conditions. Immersion testing is completed with squirters where the sound travels through a jet of water or by taking the transducer and test object and immersing them in a tank of water.